Hidden behind a row of sunflowers just outside Chapel Hill, Tennessee, sits a one-acre life-size maze, but this maze is different than most. 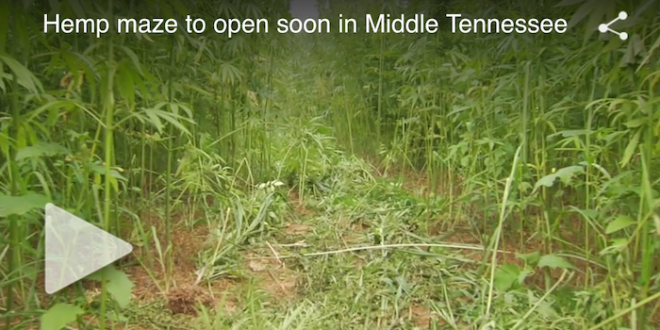 “This is about an acre of hemp that is growing,” said Colleen Keahey, director of Tennessee Hemp Industries Association. This acre will soon be open to the public, and the goal is to educate people about the differences between marijuana and hemp, but also to let people know about the various uses for hemp. “There are still people who are confused about the distinction between the two varieties of cannabis and we are hoping this maze can help turn that around,” said Keahey. Hemp can only be grown as part of a research or pilot project and that’s why the field is legal. “We are going to be sure to let people come and engage, but they are going to have to abide by the rules and regulations and that certainly means nobody can take any plant material,” said Keahey. The department of agriculture says all 63 licensed hemp growers in the state are inspected, once before the season and once after, they also make sure the THC levels are bellow a certain percent. The levels of THC in hemp is much lower than what is found in marijuana. “This is industrial hemp the THC level is very low so if anyone touches it or even should ingest some it doesn’t have adverse effects,” said Self. As for the future of industrial hemp in Tennessee, Keahey says there could be a bright future. Click here to learn more about the Tennessee Hemp Industries Association.